The winner of this tie will make their way to Group C in the regular season of the FIBA Champions League, which means there is all to play for in this tie. The Turkish side are at home first and they were placed directly into the second qualifying round while the Romanians had to overcome Cypriot opposition in the opening round to reach this stage of the competition. The Turkish side haven’t been involved in many games so far this campaign but their fans are really looking forward to the season. This is because they have managed to bring in some exciting and interesting players. Darry Monroe and Mark Lyons have both come from Maccabi Rand Media, a side which took the Israeli Winner league last season. There has also been significant captures in the shape of Rolands Freimanis, the Latvian international player, and Jeremy Hazell. If these players hit the ground running in the manner that the fans hope, this could be an exciting night and season for the Turkish team. The Romanians may not have the same level of summer signings to fall back on, but they have managed to impress in their competitive games this campaign. They’ve clinched the Romanian Supercup, won two domestic league titles and they performed well in both games in the opening round qualifier against Larnaca. With this in mind, you should expect the Romanians to be settled for this away tie and they could cause some problems against a home team that is yet to play a competitive match of the season. This may be the sternest challenge Cluj has faced this campaign so far but they are well placed to perform. Mind you, the bookmakers believe that the hosts will steamroller the Romanian side. Given that the away team may catch the hosts cold, look to go U-BT Cluj-Napoca at +10.5 which you’ll find available at odds of 1.83. Anyone interested in the Over/Under market will find that going OVER 155.5 which you can find at odds of 1.83 is likely to be a sensible bet. Bet Now! 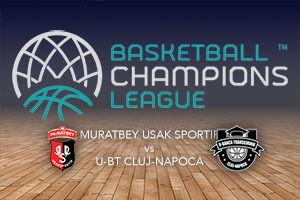 Have a look at our Basketball Odds and Lines page, where you can keep track of the history of the Muratbey Usak Sportif v U-BT Cluj-Napoca odds, as well as compare the offers from different sports betting sites.